Kim? is honoured to announce an Open Kim? 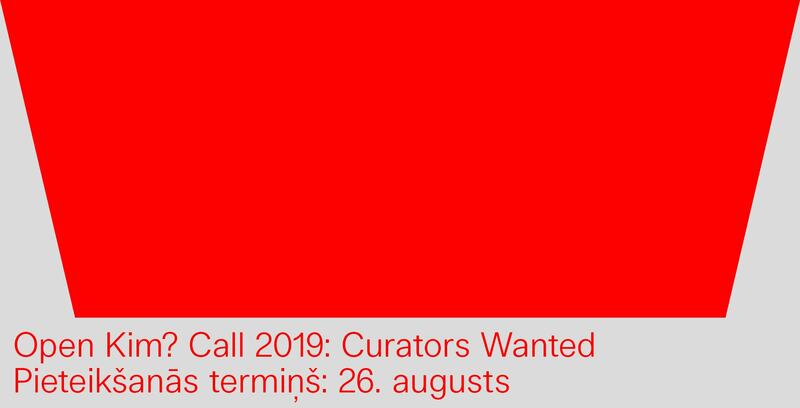 Call 2019 which this year focuses on curatorial proposals. In the background of ever-expanding art ecosystem and changing socio-political conditions in Latvia there is an urgent need to rethink an exhibition format as a media which may be used to amplify, articulate, contemplate, ignite, promote, manifest, etc. the emerging, what needs to be brought into existence as a collectively conceived experience. Thus we encourage curators (no age or experience limitations) sending us free format exhibition proposals with curatorial ideas by August 26th, 2018. – Portfolio of former creative work (incl. CV). – Financing of EUR 600 (the winner undertakes the duties of raising additional funds). The winner exhibition will be announced by September 10th and will take place in February 2019 at Kim? Contemporary Art Center. Open Kim? Call is an initiative started in 2016 in order to promote an early discovery of promising and talented artists and/or curators from Latvia. This initiative offers the best possible conditions and a working framework for the development and application of their creative ideas. Open Kim? Call 2019 applications will be inspected by the jury of Kaspars Groševs (artist/curator), Kaspars Vanags (curator), Inga Lace (curator), Santa Hirša (art critic) and Zane Onckule (Kim? Programme Director). Please send the proposals to: kim@kim.lv stating “Open Kim? Call 2019” within the subject line.